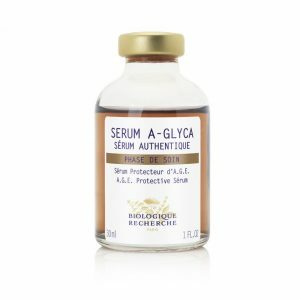 Biologique Recherche has taken an innovative approach to finding an effective solution for combating the glycation process; Sérum A-Glyca is the result. Glycation is one of the main factors in skin ageing. Formulated to keep elastin and collagen fibres intact, the serum is the perfect ally to fight the signs of ageing as well as create a more luminous complexion. It also has an antioxidant action that provides essential overall protection to combat external phenomena such as heat, UV rays and pollution that may exacerbate the glycation process. Thanks to the Serum A-Glyca, the glycation reaction can be prevented and counteracted with a gain of 2 years of glycation in 2 months of use. Read more about the glycation phenomenon. All Skin Instants® subject to the effects of ageing. Anti-glycation agent (preventive): Mimosa extract (Albizia).